On the western coast of Spitsbergen near Kapp Martin, a team of goose catchers led by Jouke Prop is catching barnacle geese. They ring the birds and take blood samples for analysis, like I do in Ny-Ålesund. Together with catching efforts in Russia and the Netherlands this is all part of IPY-project BIRDHEALTH. I just received news from Jouke via satelite telephone. 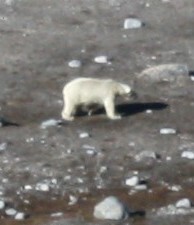 In recent years polar bears have become more frequent in the area where they are working. New food supplies have been sent to them because a polar bear had raided their food depot. Despite this misfortune, they are doing very well and have caught over 300 geese by now. The photo above is taken last year, when a polar bear mother and cub pludered the goose nests on a breeding island. 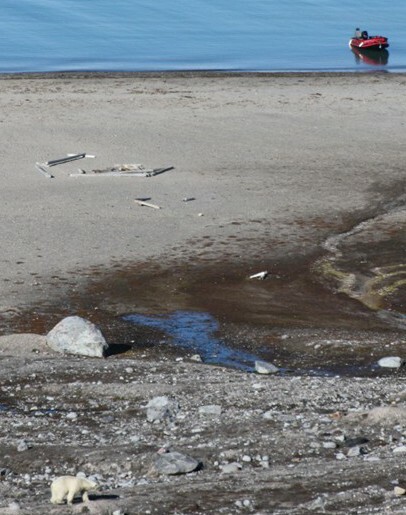 Last saturday, there have been polar bear sightings also in Kongsfjord. We are fully alert. No resighting yet. We are lucky, though ... I would like to see one from a safe distance. Elin Noreen and Claus Bech have seen two polar bears near their field site on Blomstrand island 31 July 2008. 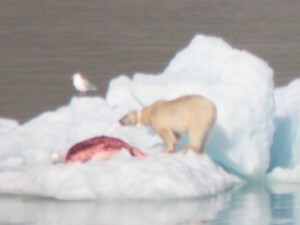 One had a radio collar and was feeding on a fresh kill on an ice flow. The next afternoon Vincent and Emmie saw one polar bear still at the same spot. 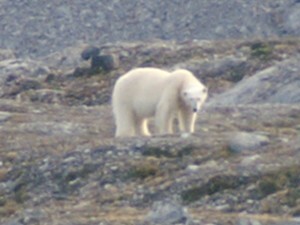 These sightings are just on the other side of the fjord, 3 kilometer north of here.